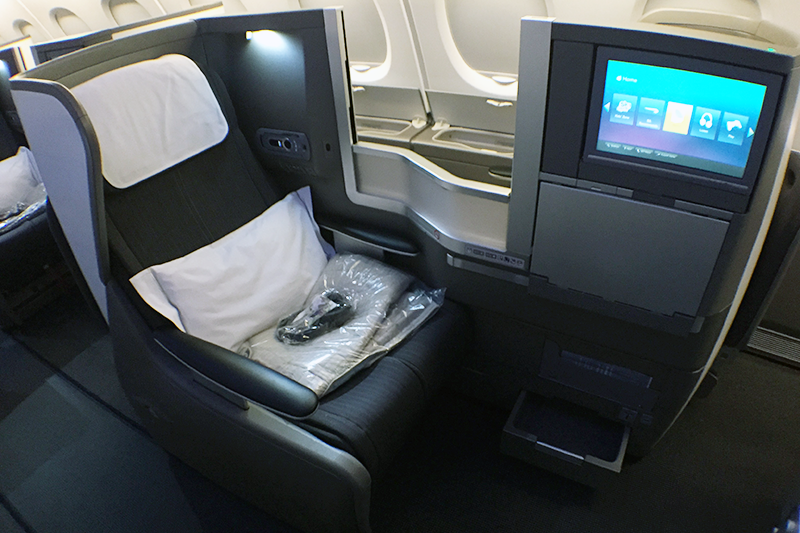 During a recent transatlantic trip, new TPG Contributor Eduardo Garcia had a chance to upgrade to Club World on British Airways’ newest A380 by converting American Express Membership Rewards points to British Airways Avios. Here’s his review of the experience. 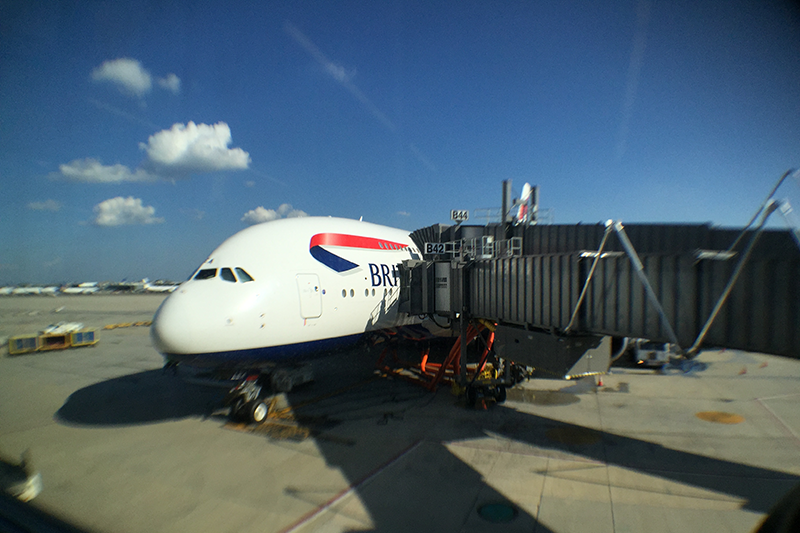 I recently flew British Airways from Washington-Dulles (IAD) to London-Heathrow (LHR) in the airline’s Club World business-class cabin aboard the A380. While I’ve heard great things about BA from others, parts of my experience didn’t live up to my expectations. If booked with cash via the British Airways website, this one-way route from IAD-LHR would have cost $8,196, including taxes and fees, though round-trip fares may be lower. My company’s travel agency initially booked this route for me in World Traveller Plus (premium economy), which cost $2,763 one-way, including taxes and fees of $256. However, I was eager to obtain an upgrade to Club World. Having access to a lie-flat bed on a long-haul flight helps me arrive at my destination ready to be productive. Since British Airways is a member of the oneworld alliance, it’s possible to upgrade from premium economy to business class using 12,500 AAdvantage miles, but since this flight was marketed and operated exclusively by British Airways (that is, it wasn’t a codeshare flight), I couldn’t use AAdvantage miles. The only upgrade award option available to me was to redeem 20,000 Avios, which I converted from Amex Membership Rewards (earned with my Premier Rewards Gold Card) at a 1:1 ratio. Booked in cash on the British Airways site, Club World one-way on this route would have cost $8,195, inclusive of taxes and fees of $441. Club World seats are arranged in a 2-3-2 configuration in the A380 upper cabin, but you still have to climb over someone else’s feet to access the aisle. British Airways has a Galleries Lounge at Dulles’ Terminal B. As a oneworld member, I’ve previously visited this lounge when traveling on American Airlines, but despite finding it attractive, I’ve been disappointed by the early closing times and aloofness of the staff. This time, however, I found that the lounge had been completely renovated, and new, friendlier staff had been hired. 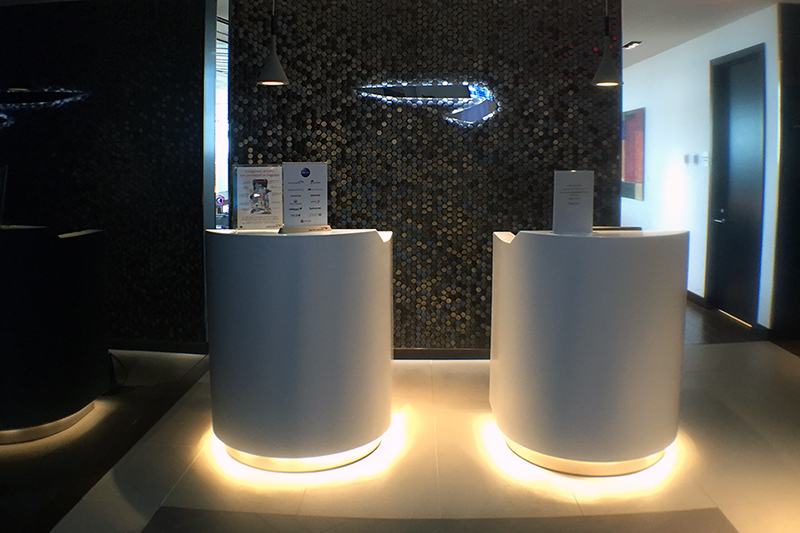 The newly renovated British Airways Galleries lounge is located on the mezzanine of the departures level at IAD. I love that this lounge has lots of natural light and panoramic views of both the inside and outside of the terminal. The horseshoe-shaped bar overlooks the tarmac, providing a great place to sip a cocktail while plane-spotting. There’s also plenty of comfortable seating alongside the floor-to-ceiling windows overlooking the inside of the terminal, enabling you to people-watch from above. 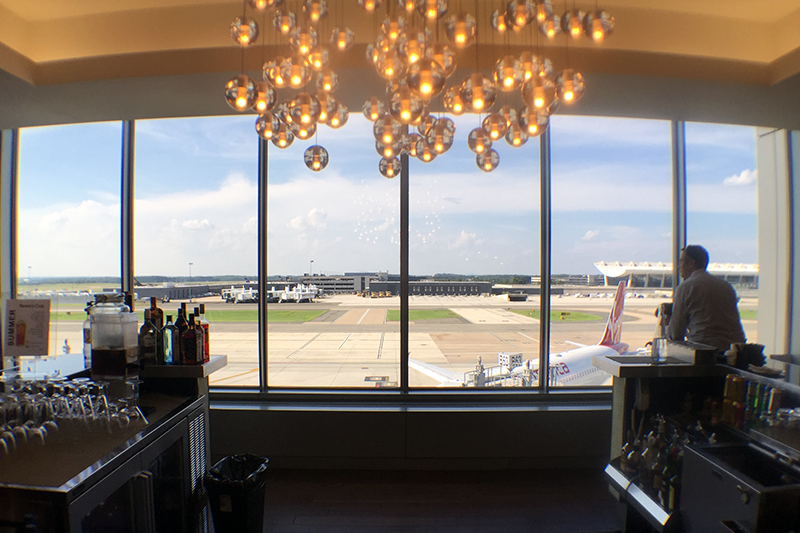 The new renovations allow plenty of natural light and magnificent views throughout — like this one from behind the bar. The lounge had a broad selection of beverages and hors d’oeuvres, and those traveling on Club World can grab a hot buffet dinner from an adjacent dining room. If you’re traveling in British Airways First Class or are a Concorde Room cardholder, you also get access to the exclusive Concorde dining room, where you can order dinner a la carte. 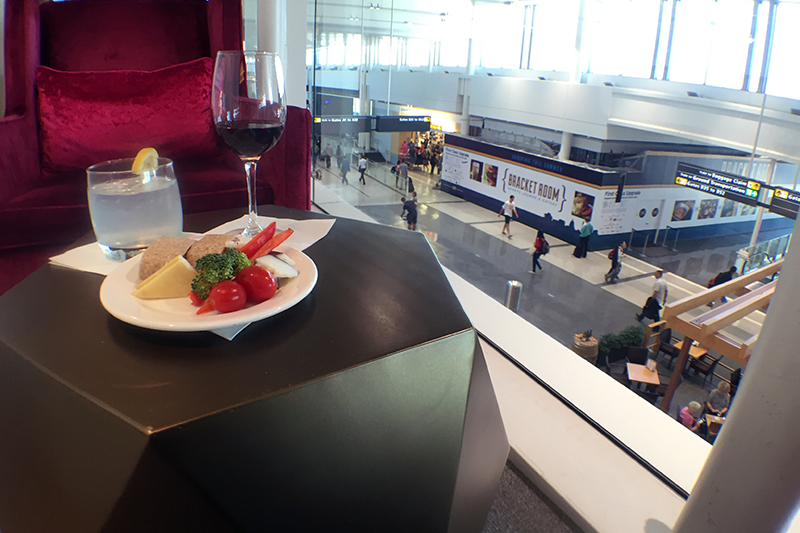 You can enjoy a glass of wine with light hors d’oeuvres while people-watching from the lounge. When it came time for boarding, the gate was a madhouse. The gate agents were stressed out (a common occurrence here), but fortunately, I was able to pre-board so I could take photos of the plane. A small delay ensued at the jet bridge because the air conditioning had been off for a while and it was very hot. Eventually they let us go, but it was an uncomfortable walk to the upper-deck cabin — which was also very warm — and some elderly people behind me almost fainted. In all, it took about 30 minutes for everything to settle back to normal. I was able to pre-board in order to take clear photos of the plane. The upper cabin is divided into three sections. Toward the front, there are two huge lavatories and a grand staircase with cove lighting in a soothing blue. The majority of the front of the cabin is taken up by Club World seats, followed by a couple rows of World Traveller Plus and a smaller World Traveller (economy) section. Toward the back of the plane, there’s also a staircase and two smaller lavatories. 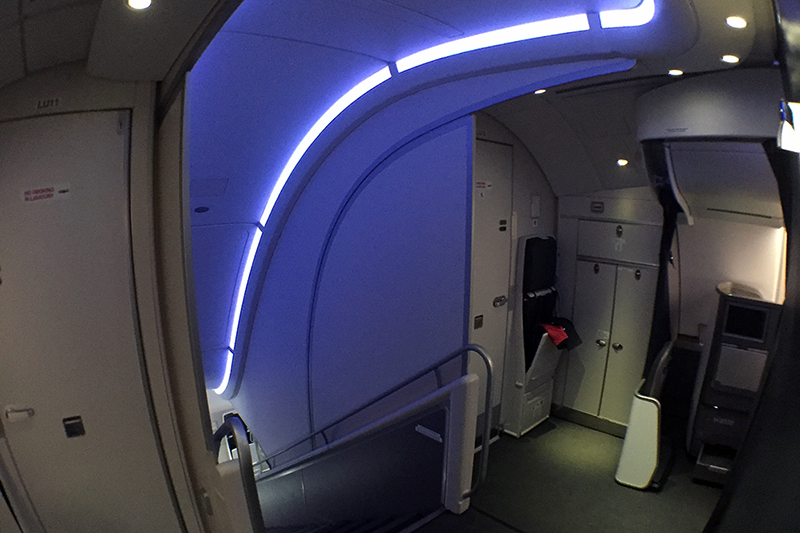 The blue-lit stairway toward the front of the plane makes for a grand entrance to the upper cabin, or a convenient place for a quick mid-flight exercise. Club World seats are semi-enclosed pods facing both forward and backward alternately. The upper-deck business cabin has a 2-3-2 configuration, while the lower deck cabin has a 2-4-2 configuration. I had selected seat 53A since it has direct aisle access without needing to climb over someone else’s feet; this is only possible toward the end of each cabin section. Between seats there is a retractable privacy partition that can be operated at the touch of a button. There’s also a foldable table and a 12.1-inch TV screen that swivels from a panel on the side. 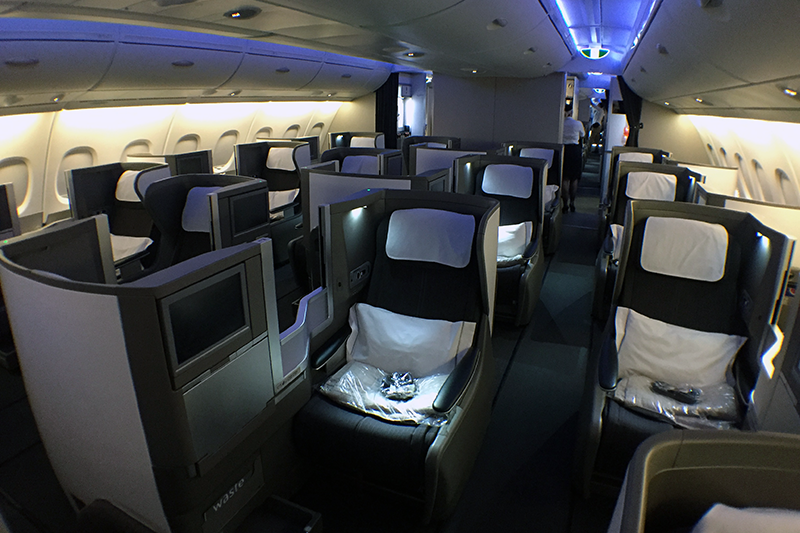 A Club World seat on British Airways’ A380. The seat itself is very comfortable; it breathes and maintains a cool temperature because it’s upholstered with fabric. To create a bed, you have to unfold the footrest while reclining the seat flat. Adjusting the seat can be painful, since the buttons aren’t positioned ergonomically, and the footrest latch is difficult to reach when seated. Each seat has a large storage drawer toward the bottom, alongside an AC power socket and a USB port. There’s also a retractable remote control and small reading light. The footrest folds down and combines with the lie-flat seat to create a bed. There’s also a storage compartment in the upper-cabin window seats. 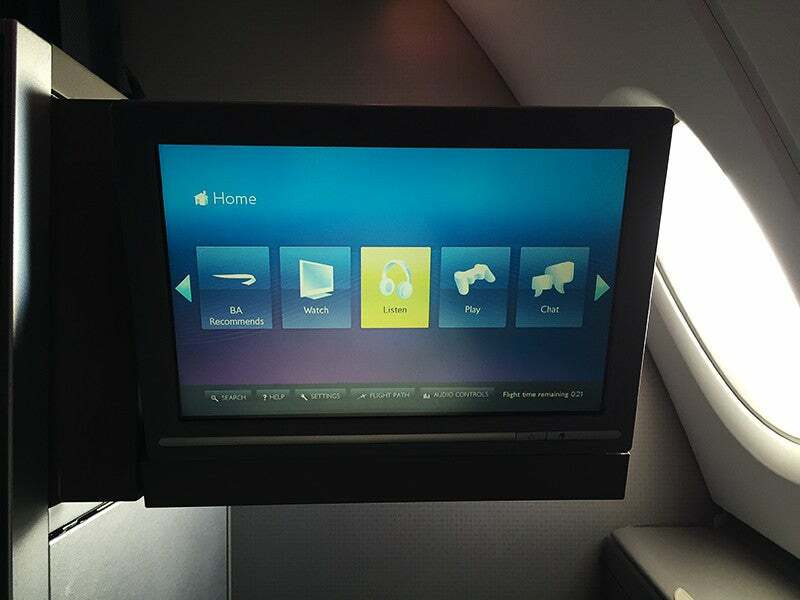 The in-flight entertainment system offers a wide selection of music, TV and movies. However, British Airways is one of the few carriers that doesn’t offer in-flight Wi-Fi (with a few limited exceptions). I found this to be a huge negative, as I was hoping to get some work done en route to London. A 12.1-inch touchscreen TV monitor can be released at the touch of a button. 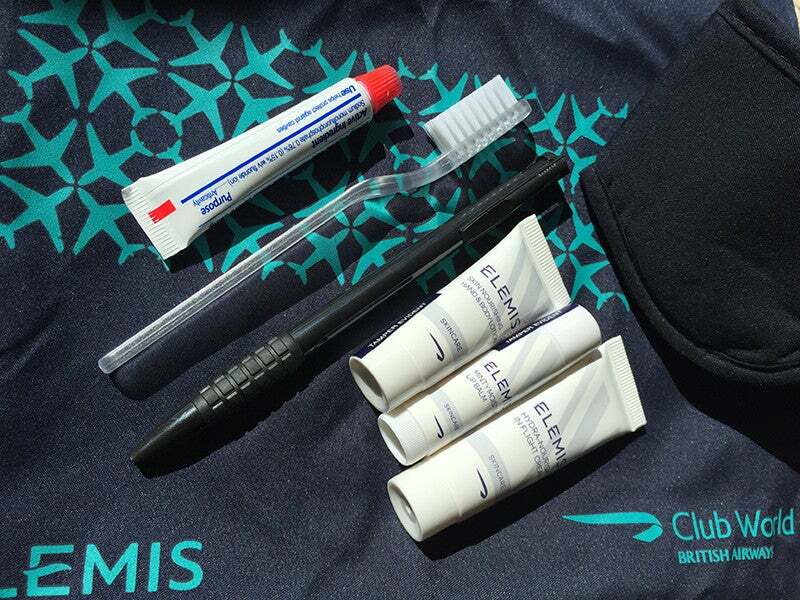 British Airways offers an amenity kit for its Club World passengers, consisting of British-made Elemis skincare products, a toothbrush, pen, socks and an eye mask. These are encased in a drawstring bag that’s presumably designed to serve as shoe storage. However, given my large feet, I found this concept pretty useless. I’d advise not opening the lotion bottles while in-flight, as the contents will ooze out quickly due to the difference in cabin pressure. No-frills amenities provided by British Airways consist of Elemis lotion and lip balm, a toothbrush, pen, socks and an eye mask. Each seat has a thick blanket and pillow, and a set of noise-canceling headphones. Unlike American Airlines, which provides Bose QuietComfort headphones, these were non-branded and marginally effective. Unfortunately, you can’t use your own earbuds or headphones, since the Club World headphone socket is incompatible with standard jacks. As we crossed 10,000 feet, flight attendants began to distribute the menus, hot towels, small bags of nuts, juice, Champagne and water. On this route, dinner is served right after takeoff, and a snack is offered about two hours prior to landing. I found the beverage selection to be excellent, with at least three options for each different kind of wine and premium spirits. While the food was tasty, it was nothing over the top. 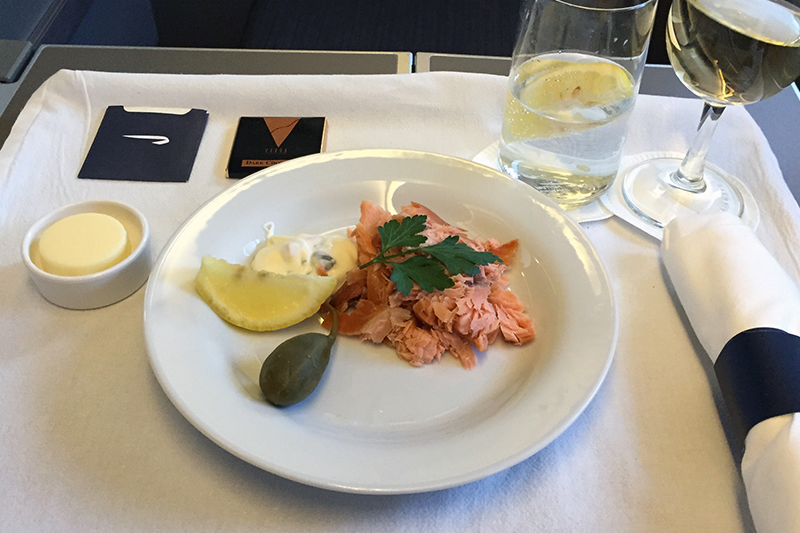 If you’re looking for a gourmet culinary experience with white-glove service, British Airways unfortunately lags far behind Middle Eastern airlines like Etihad, Qatar and Emirates in this area. While the meals are tasty, don’t expect anything over the top. 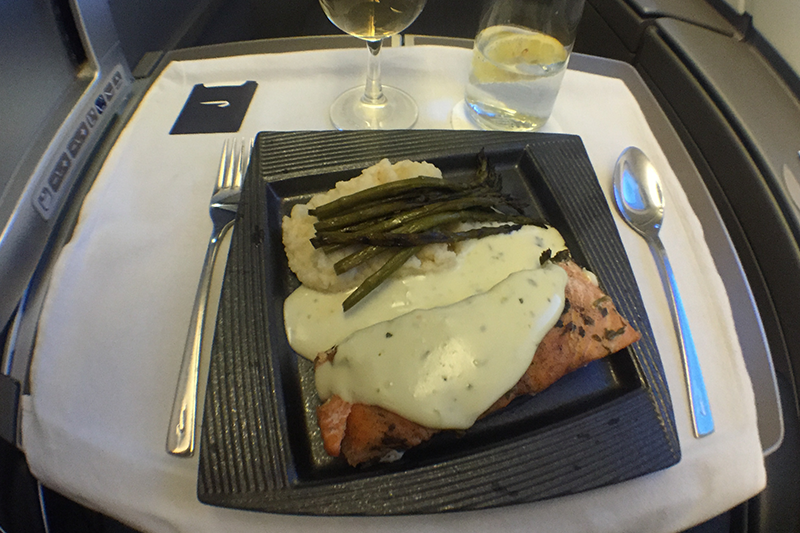 I ordered smoked salmon as my starter (my British flight attendant corrected me when I asked for this dish as my appetizer), followed by grilled fish with béarnaise sauce, mashed cauliflower and asparagus. I didn’t feel like indulging in too many alcoholic beverages, because I didn’t want to worsen any potential jet lag. A decent-sized portion of grilled fish with béarnaise sauce, mashed cauliflower and asparagus. Flight attendants came back to offer a selection of breads, clear the dinner plates and serve dessert. Chocolate cake that tasted a lot better than it looked. 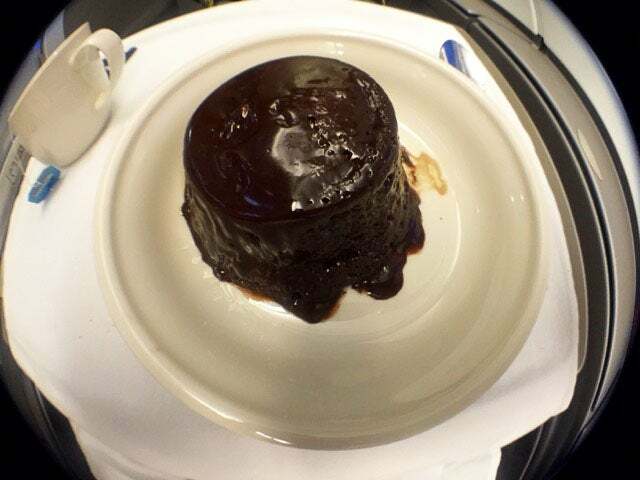 I asked for the warm chocolate cake, and although it was delicious, the presentation was pretty sloppy; it didn’t look like anything you’d actually want to eat. Coffee and tea was offered as well, so I had a relaxing cup of chamomile. If you get hungry during the remainder of the flight, the Club World Kitchen provides an assortment of snacks and drinks that you can pick up from the galley in the middle section of the upper cabin. On display were soft drinks, juices, water, finger sandwiches, fruit, chips and chocolates. The Club World Kitchen provides an assortment of snacks and drinks that you can pick up from the galley in the middle section of the plane. 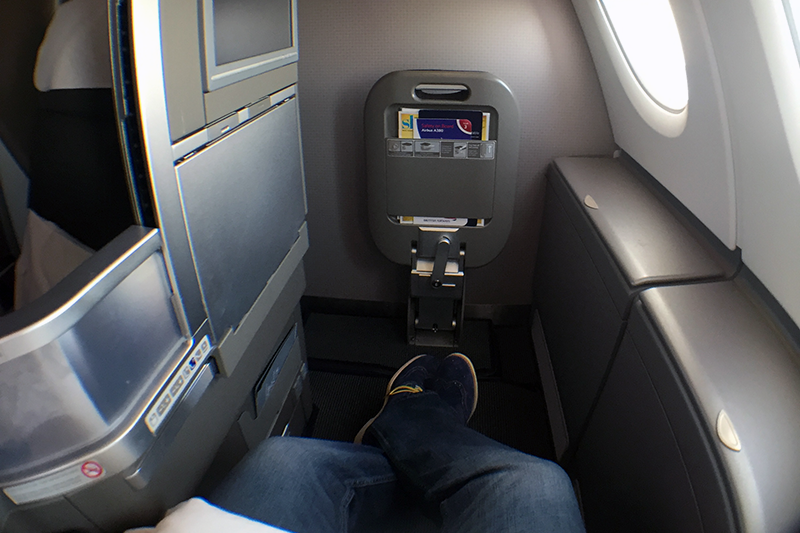 British Airways has a pretty solid business-class product, but considering the price of the ticket, you can get more bang for your buck aboard other carriers. While this may have been a leading-edge product a few years ago, when compared to JAL, Etihad, Qatar and even American Airlines, British Airways falls far behind. With no Wi-Fi, subpar amenities kit, poorly presented food and no true direct-aisle access, it’s a straightforward product that gets you from point A to point B comfortably, but with no frills. In my personal opinion, British Airways should reduce the price of Club World by at least 20% or consider making significant improvements in order to level up with its Middle Eastern and American competitors. It’s already a very costly proposition to stop in London en route to another destination, considering you can stop in the Middle East for far less and get much more out of your travel experience.